Abe Sensei started Karate and Judo training when he was 15 years old. In 1956 he entered the Japan Engineering University in Tokyo from which he graduated in 1960. In 1958 Abe Sensei started to train at the Headquarters of the Japan Karate Association (JKA) where he met a young and powerful Sensei, NAKAYAMA Masatoshi Sensei, who was to become his grand master. Abe Sensei trained there every day for nearly 35 years. Abe Keigo Sensei had an accomplished record as a karate tournament competitor, taking first place in the inaugural JKA National Championship, first place in the team competition at the 1973 JKA International Friendship Tournament, and first place in the second and third Japan Karate-do Federation National Championships (representing Tokyo). In 1985, two years before Sensei Nakayama's death, Sensei Abe was appointed as Director of Qualifications in the JKA. After the division of the JKA in 1990, he became the Technical Director of the JKA (Matsuno faction). He was responsible for formulating the ippon shobu tournament rules, which are used by most Shotokan karate competitors around the world, today. Abe resigned from the JKA (Matsuno faction) on January 31, 1999 and on February 10, 1999, he formed JSKA. AC Oss Sensei, welcome to India! KA Oss, thanks, I like Indian people, customs and weather! AC Sensei, you are also an actor, please share your celluloid moments..
KA I worked on the James Bond film You Only Live Twice (1967). Actually Nakayama Sensei was to appear but could not due to other commitments, so I was chosen by him instead! 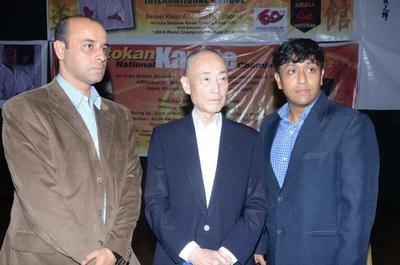 AC Sensei, what is your opinion of Indian karate-ka and the standard of training? KA I feel basic, i.e. kihon is fairly acceptable, but the standard of jiyu kumite and kata definitely needs improvement. AC Sensei, what are the objectives and philosophy of JSKA Karate? KA We have a simple vision..
KA Both traditional and sports karate are important. Youngsters get excited in sports, medals, trophies and so for them sports karate is and should be important, let them win and also lose with dignity. I will say that the sports part is one aspect of the total sphere of Karate-do. But as you mature, one needs to go back to ‘traditional’ karate – emphasis on correct kihon, spirit, form, technique, zanshin and kime. I feel that today’s Karate is centered only on winning competitions and everyone trains towards this end. But this is very far from the true purpose of Karate. I believe that the true purpose of Karate lies in daily training with a goal to develop in parallel a strong body and mind and furthermore to contribute to society in general; the Karate-do we practice has an essential purpose to attain correct control of body and mind. AC Sensei, what is your favourite kata and why? AC Sensei, your Uraken uchi and Fudo-dachi have become legendary and you have been globally respected for your deadly accuracy, fighting spirit and keen sense of timing in kumite, what is your secret of such perfected waza and fighting spirit? KA Look, its only sincere training and understanding of rotational dynamics. I am a trained engineer from Nihon University (Sensei graduated in Engineering in 1960) so I have tried to implement physics laws into my uraken uchi and other techniques. Fortunately we have been trained in JKA by Nakayama Sensei to appreciate the laws of mechanics; rotation (koshino kaiten) of hips, relaxation of elbow joints to accentuate the technique, transforming rotational momentum into linear momentum, this amplifies impact (Sensei demonstrates his lightning fast uraken). AC Sensei, you were one of the senior rmost JKA instructors, however you left JKA and later also JKS. Are there any specific reasons you wish to share? KA These were purely political reasons only, however we practice the karate we learnt at JKA and try to maintain the originality, purity and sanctity of karate-do as taught to me by Nakayama Sensei, there we have no difference on the technical matters. AC Sensei, what is your dream regarding JSKA? KA Unlike most leaders of Karate organizations, I do not want my organization to grow very large. Very large organizations mean very large problems. I want a smaller organization where I can be an active part of everyone’s life and a high degree of quality can be maintained. AC Sensei, who have been and are your role models in karate-do? KA Definitely my Sensei Nakayama Masatoshi and also Sensei Okazaki Teruyuki, in particular. AC Sensei, how has your karate changed down the years and what is your current focus in training? KA See, I am old and have become weak but my spirit is as strong! all the time I am doing ‘Image Training’, so despite declining health, my karate practice is continuous and I am still searching for ways of perfecting my waza and attitude. AC Sensei, what are the technical points in training which you are now emphasizing? KA I am laying stress on stances and footwork - the heel should not be raised from the floor. I have also taught sliding (yori ashi), balance in keri-waza and full (90 degree) hip rotation for maximum snapping action, something which my student Mikio Yahara Sensei also has propagated. Plus I have extensively taught tai-sabaki in detail. AC Sensei, who in your opinion has been Shotokan’s greatest kata exponent and kumite expert? KA (smiling) I think its Osaka Yoshiharu Sensei (JKA 8th Dan) for kata and Mikio Yahara Sensei (KWF 8Tth Dan) for kumite. Both are excellent products of Nakayama Sensei and JKA. AC Sensei, what is your advice in kumite? AC During jiyu kumite, apply ‘sen no sen’, get in and counter, disable the attack, develop ikken hissatsu technique and strong spirit (kihaku) use tai sabaki extensively to evade and then suddenly counter with 100 % power! AC Sensei, what are the points of training where senior grade karate-ka, say 4th Dan and above should focus? KA Firstly, practice ‘sun dome’ controlled explosive techniques. Use makiwara, geta extensively, build up your power and have a friendly attitude sharing notes mutually so that collective growth and development in technique will be possible. Put your conscious will power into karate practice, not just wandering around in dojo and championships. Apply the full heart and soul in your karate to become a better rounded personality. Also, in the old days the Bushi (warriors) would train in maybe 18 different arts out of battlefield necessity, so yes, I would recommend cross-training. AC Sensei, finally please share your future plans. KA We are looking at a JSKA World tournament in Italy in 2014, Germany in 2016 and Switzerland in 2018, I am a bit weak but I will fight on! AC Sensei, thanks a lot for inspiring us with your thoughts and valuable advice. We invite you to visit and teach us again in the near future and hope to see you soon at JSKA Honbu dojo in Tokyo. Oss.